It is interesting sometimes the buildings that get included on tours during an Art Deco World Congress. The trip to Bartlesville during the Tulsa World Congress in 2001 included a quick stop at the Redeemer Lutheran Church to see the Education Building dating from 1959 and designed by Bruce Goff. 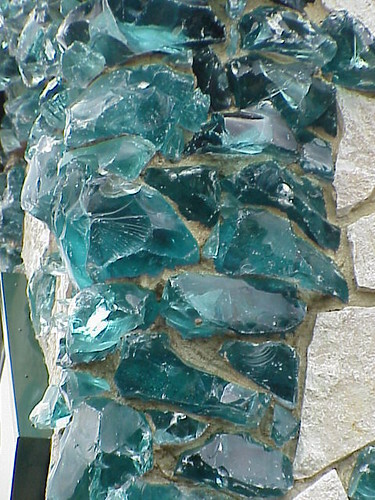 I wouldn't call it deco but I did find the combination of chunks of glass interspersed with the irregular blocks of stone forming the rest of the wall. 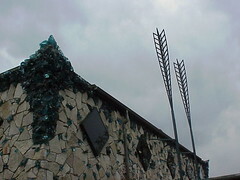 Even the windows are set in the wall as diamonds as if to further enhance the crystaline feeling to the building. 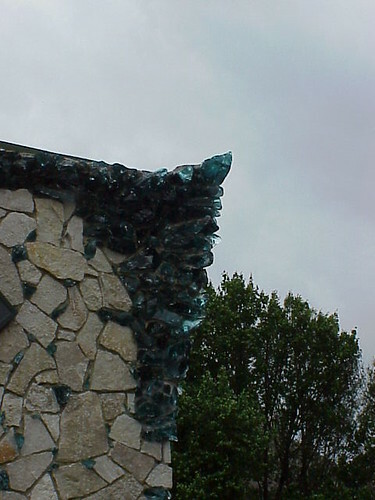 At the corners of the building the glass takes over from the stone creating these point. I can't decide if they are futuristic or prehistoric. It is certainly very organic.